Machin Forum :: View topic - Postal orders on www.uscoininfo.com/gallery/! Posted: Tue Feb 16, 2010 12:39 pm Post subject: Postal orders on www.uscoininfo.com/gallery/! You can see some photos of postal orders here; www.uscoininfo.com/gallery/. You can join up there. Here's a link that shows my photos; http://www.uscoininfo.com/gallery/u6-bcnumismatics.html . You can see my postal order photos here; http://www.allnumis.com , http://www.banknotebank.com/collection/BCNumismatics ,& http://www.notebrag.com . 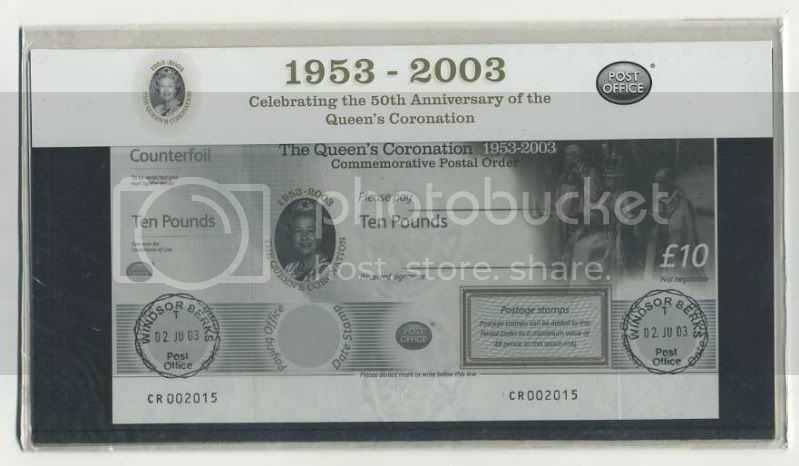 You might be interested to know that the 2003 Coronation Postal Order Presentation Pack was recently sold by Rushstamps on eBay for �50. Are they really worth that sort of money? I haven't even been offered a single postal order of that type on its own. I have been adding photos of more postal orders from various countries up onto the gallery. There were about 12 bids by three different bidders, interestingly the top bidder had increased his actual bid (and was therefore the top 2 bidders), so don't know what actual value he placed on it. Arthur Bull queued up for three hours to make sure he got his hands on history. But the shrewd engraver never had any intention of cashing in the one shilling postal order, one of the first to be sold after their inception in 1881. Predicting it would one day be worth a small fortune, he put it in a leather case and locked it in a safe. On Wednesday he was proved right when his grandson�s widow auctioned it for almost �4,500, far above its guide price of �2,500. It was snapped up by an anonymous collector. Have you heard of the Postal Order Society? You should get in touch with them. Who knows,you may end up joining up for the bargain price of 5 Quid a year. I am one of the only 2 members of the Postal Order Society from here in New Zealand. I have been pretty lucky with getting New Zealand-issued British Postal Orders,but New Zealand Postal Notes are far harder to find now. Check out the new additions to my collection here; http://www.coinforums.com/gallery/u6-bcnumismatics.html . Click on 'Per Page',then pull down to '90',then click 'Sort Now'.